Saturday brought some of the same challenges as Friday. We didn’t have to get up really early for work. In fact, we didn’t have to start until late afternoon. That meant I had to find something for lunch before going to work. Just like the night before, I wanted something quick and cheap. I decided to walk in the Shaw Neighborhood near our hotel to see what I could find. Pretty much all I could find was hip sit down restaurants. Not really what I was looking for. I put “sandwich” in to Google to see what would come up. I got about ten different Subway’s and a place called SUNdeVICH. 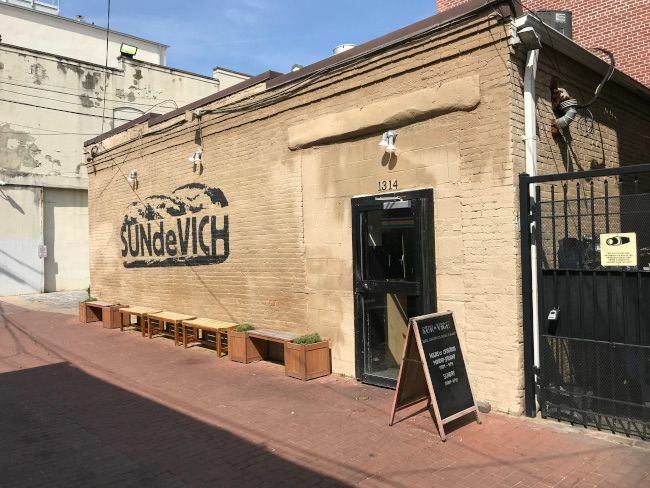 SUNdeVICH is a counter service sandwich shop in an alley off 9th Street between N and O. The alleyway entrance is right across the street from the BP gas station on 9th. The restaurant itself is about halfway down the block in an old garage that has been converted into the restaurant. The restaurant is small but they make good use of the space. 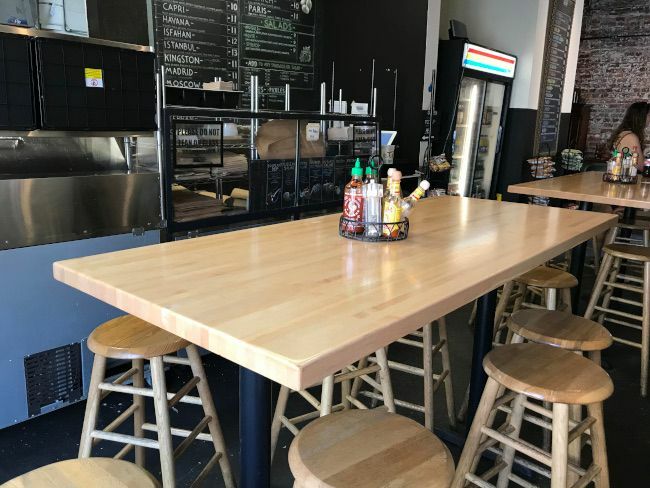 There are some pub tables in the middle of the space and some counters along the wall to eat at. There was a little bit of crowd in their when I stopped but it seemed everyone was taking their sandwiches to go. There’s a small order counter next to the kitchen. 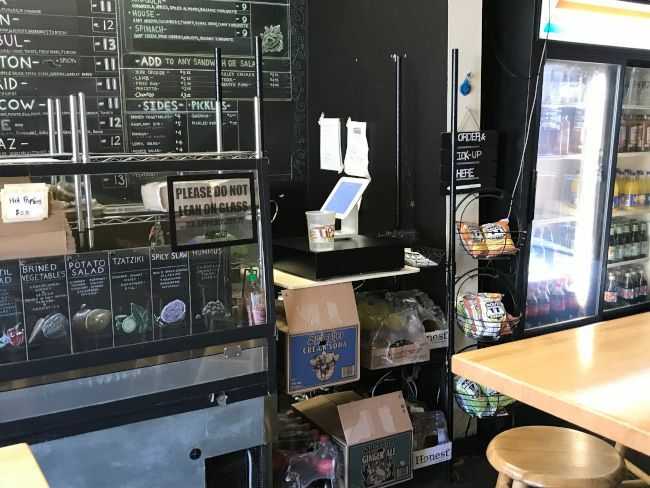 The sandwich creations are all written on chalkboards both behind the register and near the entrance by the door. I quickly scanned it until I found one that sounded good then made my way up to order. I picked the Havana which is, for the most part, a traditional Cuban sandwich. The sandwich is put together on a sub bun with roasted pork, Gruyere, pickles, and dijonnaise. The sandwich isn’t pressed like a Cuban would be but it has all of the delicious ingredients. 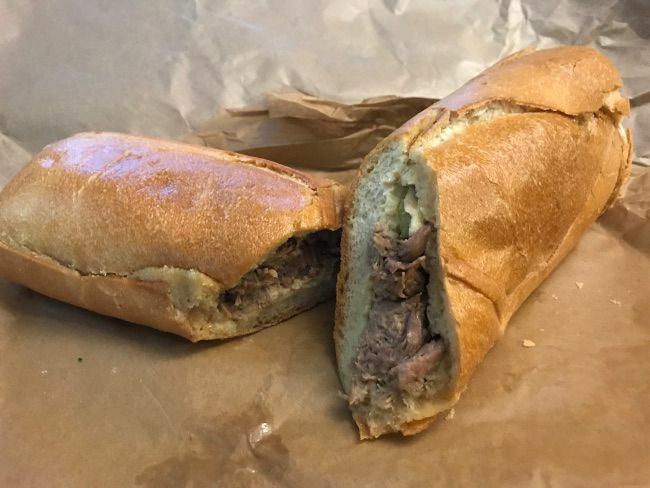 There was a decent about of pork stuffed into the firm bread to where each bite tasted more like pork than you’d expect. The rest of the ingredients were spread over thing layers so there was just a hint of each flavor while the roast pork dominated. My sandwich was right around $12 and it was exactly what I was looking for when I ventured out of the hotel for lunch. 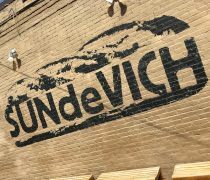 SUNdeVICH is a good find if you can find it. I wouldn’t have found it without the help of Google although there is a sign painted on the house at the end of the alley. I was pretty glad I decided to try Google when I couldn’t find anything to eat. SUNdeVICH was the fairly cheap counter service sandwich I was looking for and the sandwich was both filling and delicious.